The incidence of colorectal cancer (CRC) is increasing worldwide, making it the third most common cancer in men and the second most common in women [1, 2]. Mortality from CRC increases with advancing stage, with a significant drop in 5-year survival for stage IV disease. Mortality also correlates with the country’s gross domestic product (GDP), with higher mortality rates in countries with lower GDP [1, 3]. Similarly, the cost of colon cancer care depends on the stage at presentation, with costs including only surgery and surveillance for patients with early disease, but adds the cost of chemotherapy and/or radiation therapy for patients with more advanced disease . The cost of chemotherapy can be prohibitive in low and middle income countries (LMIC) , while in these settings, the cost of surgery and surveillance can be manageable, given the reliance on local resources, including a physician workforce able to provide screening and treatment services, and inpatient hospital facilities available to provide care. CRC is a perfect candidate for screening. Most CRCs develop from a precursor lesion, an adenomatous polyp, over a course of approximately 10 years . Screening not only identifies CRC at an early stage but also can prevent the disease by identifying the precursor lesion that can be removed before it develops into cancer. Further supporting the potential benefits of CRC screening is the high incidence of CRC, its long preclinical and precancerous period, and the availability of treatment. Multiple studies have demonstrated that CRC screening is cost effective in high-income countries with incremental cost-effectiveness ratios (ICERs) ranging from $611 to $103,000 per quality-adjusted life-year (QALY) [6–10]. In LMIC, however, there is a paucity of studies evaluating the cost-effectiveness of CRC screening. Ukraine is an example of a LMIC with reasonable local resources in terms of available physicians and infrastructure, but limited financial means. Currently, the country does not have an established CRC screening program and 35% of CRC patients die within a year of diagnosis, likely reflecting the late stage at diagnosis and lack of financial resources to make costly chemotherapy agents available to all patients . In fact, 25% of patients with CRC in Ukraine do not receive any treatment . The aim of this study was to assess the cost-effectiveness of various CRC screening strategies including no screening to inform the decision if implementing a screening program in Ukraine is cost-effective. We incorporated clinical and economic data from the published literature in a simulation model to compare the different CRC screening strategies over a lifetime time horizon in terms of costs per QALY. We modified a model structure of a previously-published Markov cohort model  to evaluate the cost-effectiveness of implementing a national screening protocol in Ukraine compared with the current situation of no screening (Fig. 1). We assumed that screening started for 50-year-old members of the population with an average cancer risk and that screening continued to the age of 75 years. We adopted the third party perspective and modeled clinical events and costs over a lifetime time horizon. The cycle length of the Markov model was 1-year. We implemented the model in TreeAge Pro (TreeAge Software Inc, Williamston, MA) and audited calculations via MS Excel. Table 1 lists the model parameters and key assumptions. 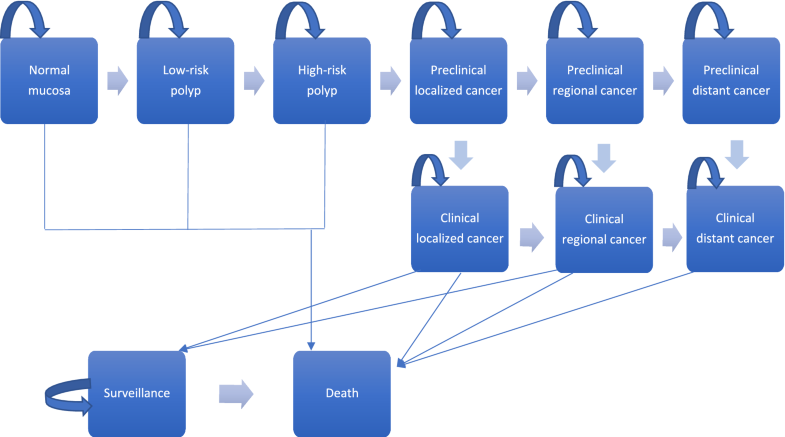 Persons entered the model at the age of 50 and could reside in any of the following health states: normal mucosa, low risk polyp (< 1 cm), high-risk polyp (> 1 cm), preclinical CRC (localized, regional, and disseminated). They could transition between states in yearly time intervals, stay in their current state or develop clinical CRC (localized, regional, and disseminated). Persons could either die from cancer or from other causes or be in surveillance after treatment for colorectal cancer. We used data from the published literature to obtain estimates of the prevalence of the polyps and age-specific transition probabilities [12–19] (Table 1). We adjusted the estimates of prevalence of the polyps to the incidence based on age of CRC in Ukraine. We used 2013 Ukrainian life tables from the World Health Organization for background mortality. We estimated stage-specific CRC mortality with treatment using US data from the Surveillance, Epidemiology and End Results (SEER) database, given that the data on CRC mortality in Ukraine doesn’t represent mortality with treatment since large proportion of patients to not receive cancer specific treatment . We used the National Cancer Registry of Ukraine database to estimate current Ukrainian CRC incidence, mortality, and treatment adherence . 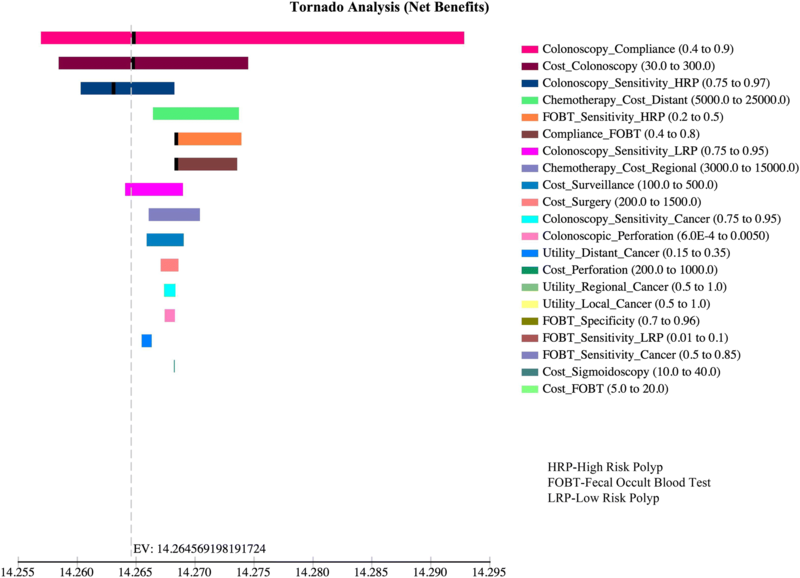 In this analysis we included three different screening strategies that would be reasonable to implement in a LMIC with an established medical infrastructure: (1) yearly FOBT, followed by confirmatory colonoscopy if positive; (2) flexible sigmoidoscopy every 5 years with FOBT yearly, also followed by colonoscopy if positive; (3) colonoscopy every 10 years [20–30]. Data on detection rate of these three screening scenarios, data on adherence with screening, screening complications rates, and utilities were obtained from screening studies conducted in Western countries and are displayed in Table 1 [17–22, 31]. We assumed no polyp removal during sigmoidoscopy, but instead that polyps are removed as part of a full colonoscopy procedure. We calculated costs from the third party payer perspective, in this case, the Ukraine Ministry of Health, and included direct treatment and screening costs. Indirect costs that are incurred by the patients such as transportation and lost productivity were not included. Screening costs were based on the manufacturer’s price for FOBT and on prices charged by private medical institutions in Ukraine (Table 1). We estimated treatment costs based on chemotherapy third party prices that the Ministry of Health of Ukraine pays for medications, as documented on the Ministry’s website . We assumed doses appropriate for a 70 kg male and calculated costs for regional cancer [5-fluorouracil + Leukovorin + Oxaliplatin (FOLFOX for 12 cycles)] and disseminated cancer (FOLFOX + Bevacizumab for 12 cycles) regimens. We obtained surgical and radiation therapy costs from private clinics and modified them to reflect what would be reasonable in the public sector based on expert opinion from personnel at the National Cancer Institute of Ukraine (Personal communication with Dr. Kolesnik and Dr. Lukashenko). All costs were translated to 2012 US dollars. We compared the four strategies by conducting a cost-effectiveness analysis. Strategies that were more costly and less effective than an alternative option were considered dominated and therefore excluded from the final cost-effectiveness calculations. 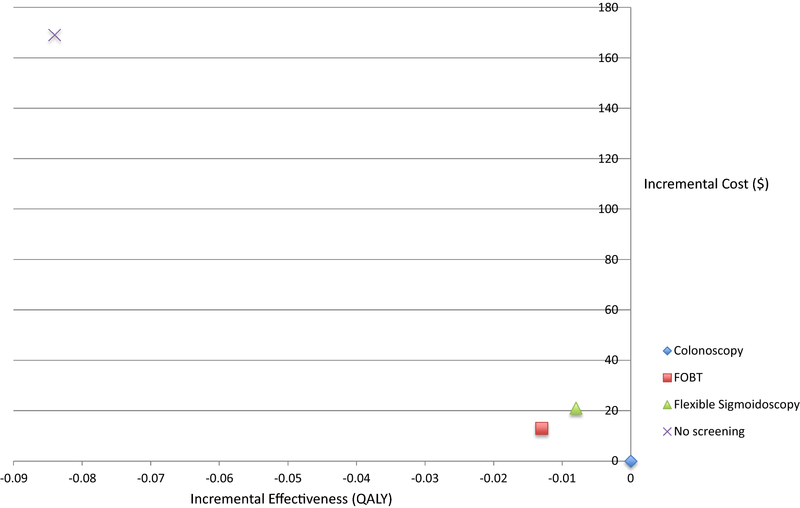 For the remaining strategies, the incremental cost-effectiveness ratio (ICER) was calculated as the additional costs divided by the additional health benefit of the strategy compared with the next best non-dominated strategy. The most cost-effective strategy was then identified by comparing the ICERs against the willingness-to-pay (WTP) threshold for an additional QALY. We chose a WTP threshold of three times the per-capita gross domestic product (GDP), which is $11,700 US dollars per QALY (Ukraine’s annual per capita GDP is 3900 US dollars) . The most cost-effective option was the strategy with the highest ICER below this WTP threshold. We discounted future costs and effectiveness at an annual rate of 3%, consistent with recommendations in the field of health economics . We conducted sensitivity analyses to determine the impact of different variables on the cost-effectiveness results. We tested the uncertain variables in the model in one-way sensitivity analyses. The variables that we varied were adherence with screening, test characteristics, rate of complications, and costs of screening strategies and treatment. The ranges were chosen based on existing literature for variation on natural history, test characteristics, and adherence parameters and based on expert opinion for cost parameters (Table 1). We conducted two and three-way sensitivity analyses on the assumptions that had the greatest effects on the cost-effectiveness results identified in the one-way sensitivity analyses. 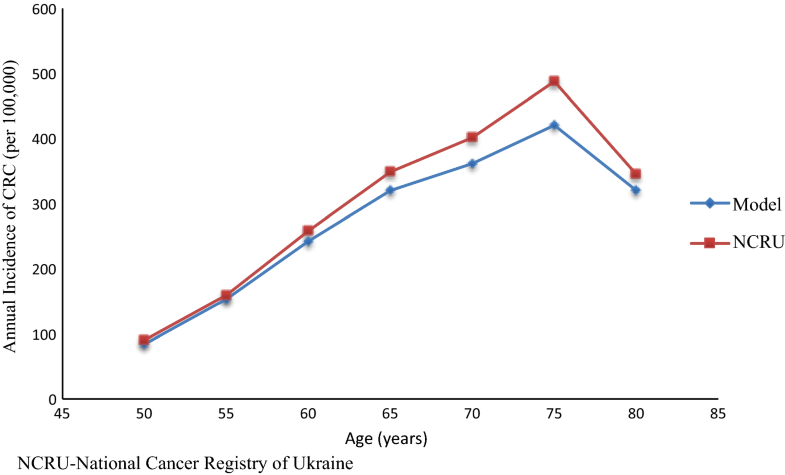 Figure 2 shows the annual incidence of CRC per 100,000 persons by age for the model predictions and data from the National Cancer Registry of Ukraine in 2013–2014. The figure illustrates that the observed incidences were very similar to what the model predicted. The lifetime costs, effects, and cost-effectiveness of the different scenarios are presented in Table 2. All screening programs were less costly and more effective compared with the no screening program. FOBT yearly, sigmoidoscopy with FOBT every 5 years, and no screening were all more costly and less effective than colonoscopy every 10 years (Fig. 3). Mortality estimates (Table 2) demonstrate benefits with all three screening scenarios compared to no screening, with colonoscopy every 10 years producing the greatest benefits in terms of decreased mortality. Colonoscopy screening every 10 years decreased colon cancer mortality by 73% compared to no screening. FOBT decreased mortality by 61.6% and flexible sigmoidoscopy with FOBT decreased mortality by 64%. The results of the one-way sensitivity analyses show that the variable cost of colonoscopy and decreased compliance with colonoscopy have an impact on the most optimal screening scenario. The optimal screening scenario changes from colonoscopy every 10 years to sigmoidoscopy with FOBT when the costs of colonoscopy exceed the threshold value of $236 and the probability of compliance with colonoscopy falls below the threshold value of 0.66. The cost of cancer treatment or surveillance in the range tested did not impact the preferred strategy (Fig. 4). In the scenario with decreased adherence to treatment, currently present in Ukraine, all the screening strategies were still cost effective, and the colonoscopy was still the most cost effective strategy with an incremental cost effectiveness ratio of $843. Using a Markov cohort model, we compared the cost-effectiveness of three screening strategies compared to no screening starting in a 50 year-old population from the third party payer perspective. Our results indicate that the CRC screening strategies included in our analysis are cost saving in Ukraine compared to the current state of no national screening program. Colonoscopy every 10 years is the optimal screening program in terms of costs per QALY and decreased mortality. Results were sensitive to the cost of colonoscopy and adherence to screening. Even when we evaluated the scenario of lower adherence to cancer treatment, which is currently the situation in Ukraine, the results did not change with colonoscopy every 10 years as the preferred strategy with an ICER of $843, which is well below the WTP threshold for health of $11,700 per QALY. There are multiple studies from the US and high-income European countries that demonstrated the cost effectiveness of CRC screening [8, 10, 33–37]. These interventions are usually reported to be cost-effective when their ICER is less than $50,000–$100,000 per QALY. Our findings are consistent with cost effectiveness studies done in the US and Europe, although most of those studies found colonoscopy or screening in general to be favorably cost-effective, whereas we found these strategies to both improve health and save money. This observation is not surprising given that the cost of colonoscopy is very low in Ukraine in contrast to the high cost of treatment of advanced stages of CRC . Ukraine is similar to other countries in Central and Eastern Europe (CEE), which are characterized by significantly lower cancer survival then in Western European countries, and colorectal cancer is not an exception . Less effective cancer control strategies, such as low screening rate, scarcity of screening programs, less treatment options available and cost of care among many others, have been implicated . Focus on improved cancer control and prevention is of a paramount importance. The reduction in CRC mortality with screening that we found is similar to the corresponding reductions reported by prior cost effectiveness studies, thus corroborating our model [7, 8, 40]. Given that a large proportion of the patients in Ukraine do not undergo the proper treatment for their CRC, the reduction in mortality and benefit in terms of costs and health benefits to society was even greater when low treatment adherence was considered. Our analysis is not without limitations. The costs were calculated from the payer perspective. Taking the societal perspective, where the cost of lost productivity, cost of travel is included may be more appropriate but likely would not change the results given that colonoscopy is only performed every 10 years and other screening methods happen more frequently, with increased opportunity for societal costs. The model did not incorporate the potentially high cost of establishing a national screening program in Ukraine, including the costs of addressing adherence, public health campaigns to change attitudes, or other methods at the provider level to increase adherence. To our knowledge this is the first cost-effectiveness analysis focusing on screening strategies for colorectal cancer in Ukraine and has the potential to contribute significantly to the knowledge base guiding rational decision making with respect to clinical practice and health care resource allocation . If acted upon, the findings of our study may substantially improve CRC care in Ukraine and can be used to concentrate efforts on developing a national screening program. Additionally, this analysis can guide analyses in other LMIC countries with similar GDP and infrastructure. NM was involved in study design, literature search, data collection, extraction, analysis and interpretation and writing of the report. DS, JC, FN, KF were involved in study design, data analysis, data interpretation and editing the manuscript. JD, AF, AL, OK were involved in data collection, interpretation and editing. All authors read and approved the final manuscript. All data extracted from publicly available information. Brigham and Women’s Hospital, Department of Surgery. Ministry of Health, Ukraine. http://www.moz.gov.ua/ua/portal/register_medicines/. Accessed 15 June 2017.